For all media, the SVG canvas describes "the space where the SVG content is rendered." The canvas is infinite for each dimension of the space, but rendering occurs relative to a finite rectangular region of the canvas. This finite rectangular region is called the SVG viewport. For visual media [CSS2-VISUAL], the SVG viewport is the viewing area where the user sees the SVG content. Using the above information, the SVG user agent determines the viewport, an initial viewport coordinate system and an initial user coordinate system such that the two coordinates systems are identical. Both coordinates systems are established such that the origin matches the origin of the viewport (for the root viewport, the viewport origin is at the top/left corner), and one unit in the initial coordinate system equals one "pixel" in the viewport. (See Initial coordinate system.) The viewport coordinate system is also called viewport space and the user coordinate system is also called user space. (if no unit identifier is provided) values in user space -- for example, "15"
(if a unit identifier is provided) a length expressed as an absolute or relative unit measure -- for example, "15mm" or "5em"
The supported length unit identifiers are: em, ex, px, pt, pc, cm, mm, in, and percentages. A new user space (i.e., a new current coordinate system) can be established at any place within an SVG document fragment by specifying transformations in the form of transformation matrices or simple transformation operations such as rotation, skewing, scaling and translation. Establishing new user spaces via coordinate system transformations are fundamental operations to 2D graphics and represent the usual method of controlling the size, position, rotation and skew of graphic objects. The SVG user agent negotiates with its parent user agent to determine the viewport into which the SVG user agent can render the document. In some circumstances, SVG content will be embedded (by reference or inline) within a containing document. This containing document might include attributes, properties and/or other parameters (explicit or implicit) which specify or provide hints about the dimensions of the viewport for the SVG content. SVG content itself optionally can provide information about the appropriate viewport region for the content via the width and height XML attributes on the outermost 'svg' element. The negotiation process uses any information provided by the containing document and the SVG content itself to choose the viewport location and size. and there are CSS-compatible positioning properties [CSS2-POSN] specified on the referencing element (e.g., the 'object' element) or on the containing document's outermost 'svg' element that are sufficient to establish the width of the viewport. Similarly, if there are positioning properties [CSS2-POSN] specified on the referencing element or on the outermost 'svg' that are sufficient to establish the height of the viewport, then these positioning properties establish the viewport's height; otherwise, the height attribute on the outermost 'svg' element establishes the viewport's height. If the width or height attributes on the outermost 'svg' element are in user units (i.e., no unit identifier has been provided), then the value is assumed to be equivalent to the same number of "px" units (see Units). The initial clipping path for the SVG document fragment is established according to the rules described in The initial clipping path. For the outermost 'svg' element, the SVG user agent determines an initial viewport coordinate system and an initial user coordinate system such that the two coordinates systems are identical. The origin of both coordinate systems is at the origin of the viewport, and one unit in the initial coordinate system equals one "pixel" (i.e., a px unit as defined in [CSS2 lengths]) in the viewport. In most cases, such as stand-alone SVG documents or SVG document fragments embedded (by reference or inline) within XML parent documents where the parent's layout is determined by CSS [CSS2] or XSL [XSL], the initial viewport coordinate system (and therefore the initial user coordinate system) has its origin at the top/left of the viewport, with the positive x-axis pointing towards the right, the positive y-axis pointing down, and text rendered with an "upright" orientation, which means glyphs are oriented such that Roman characters and full-size ideographic characters for Asian scripts have the top edge of the corresponding glyphs oriented upwards and the right edge of the corresponding glyphs oriented to the right. If the SVG implementation is part of a user agent which supports styling XML documents using CSS2-compatible px units, then the SVG user agent should get its initial value for the size of a px unit in real world units to match the value used for other XML styling operations; otherwise, if the user agent can determine the size of a px unit from its environment, it should use that value; otherwise, it should choose an appropriate size for one px unit. In all cases, the size of a px must be in conformance with the rules described in [CSS2 lengths]. Example InitialCoords below shows that the initial coordinate system has the origin at the top/left with the x-axis pointing to the right and the y-axis pointing down. The initial user coordinate system has one user unit equal to the parent (implicit or explicit) user agent's "pixel". A new user space (i.e., a new current coordinate system) can be established by specifying transformations in the form of a transform attribute on a container element or graphics element or a viewBox attribute on an 'svg', 'symbol', 'marker', 'pattern' and the 'view' element. The transform and viewBox attributes transform user space coordinates and lengths on sibling attributes on the given element (see effect of the transform attribute on sibling attributes and effect of the viewBox attribute on sibling attributes) and all of its descendants. Transformations can be nested, in which case the effect of the transformations are cumulative. Example OrigCoordSys below shows a document without transformations. The text string is specified in the initial coordinate system. Example NewCoordSys establishes a new user coordinate system by specifying transform="translate(50,50)" on the third 'g' element below. The new user coordinate system has its origin at location (50,50) in the original coordinate system. The result of this transformation is that the coordinate (30,30) in the new user coordinate system gets mapped to coordinate (80,80) in the original coordinate system (i.e., the coordinates have been translated by 50 units in X and 50 units in Y). another which is the result of a translation by 200 units in X and 40 units in Y, followed by a scale transformation of 1.5. Example Skew defines two coordinate systems which are skewed relative to the origin coordinate system. Since only six values are used in the above 3x3 matrix, a transformation matrix is also expressed as a vector: [a b c d e f]. 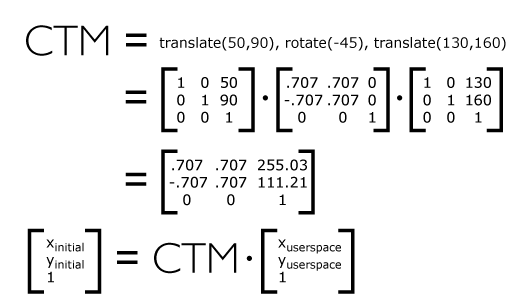 or [1 0 0 1 tx ty], where tx and ty are the distances to translate coordinates in X and Y, respectively. or [sx 0 0 sy 0 0]. One unit in the X and Y directions in the new coordinate system equals sx and sy units in the previous coordinate system, respectively. or [cos(a) sin(a) -sin(a) cos(a) 0 0], which has the effect of rotating the coordinate system axes by angle a.
or [1 0 tan(a) 1 0 0], which has the effect of skewing X coordinates by angle a.
or [1 tan(a) 0 1 0 0], which has the effect of skewing Y coordinates by angle a. Example Nested illustrates nested transformations. matrix(<a> <b> <c> <d> <e> <f>), which specifies a transformation in the form of a transformation matrix of six values. matrix(a,b,c,d,e,f) is equivalent to applying the transformation matrix [a b c d e f]. translate(<tx> [<ty>]), which specifies a translation by tx and ty. If <ty> is not provided, it is assumed to be zero. scale(<sx> [<sy>]), which specifies a scale operation by sx and sy. If <sy> is not provided, it is assumed to be equal to <sx>. rotate(<rotate-angle> [<cx> <cy>]), which specifies a rotation by <rotate-angle> degrees about a given point. If optional parameters <cx> and <cy> are not supplied, the rotate is about the origin of the current user coordinate system. The operation corresponds to the matrix [cos(a) sin(a) -sin(a) cos(a) 0 0]. If optional parameters <cx> and <cy> are supplied, the rotate is about the point (<cx>, <cy>). The operation represents the equivalent of the following specification: translate(<cx>, <cy>) rotate(<rotate-angle>) translate(-<cx>, -<cy>). skewX(<skew-angle>), which specifies a skew transformation along the x-axis. skewY(<skew-angle>), which specifies a skew transformation along the y-axis. All numeric values are real <number>s. "translate" wsp* "(" wsp* number ( comma-wsp number )? wsp* ")"
"scale" wsp* "(" wsp* number ( comma-wsp number )? wsp* ")"
"rotate" wsp* "(" wsp* number ( comma-wsp number comma-wsp number )? wsp* ")"
"skewX" wsp* "(" wsp* number wsp* ")"
"skewY" wsp* "(" wsp* number wsp* ")"
See the 'animateTransform' element for information on animating transformations. It is often desirable to specify that a given set of graphics stretch to fit a particular container element. The viewBox attribute provides this capability. All elements that establish a new viewport (see elements that establish viewports), plus the 'marker', 'pattern' and 'view' elements have attribute viewBox. The value of the viewBox attribute is a list of four numbers <min-x>, <min-y>, <width> and <height>, separated by whitespace and/or a comma, which specify a rectangle in user space which should be mapped to the bounds of the viewport established by the given element, taking into account attribute preserveAspectRatio. If specified, an additional transformation is applied to all descendants of the given element to achieve the specified effect. A negative value for <width> or <height> is an error (see Error processing). A value of zero disables rendering of the element. Example ViewBox illustrates the use of the viewBox attribute on the outermost 'svg' element to specify that the SVG content should stretch to fit bounds of the viewport. viewBox="0 0 1500 1000" preserveAspectRatio="none"
<!-- This rectangle goes from (0,0) to (1500,1000) in user space. <rect x="0" y="0" width="1500" height="1000"
Unlike the transform attribute (see effect of the transform on sibling attributes), the automatic transformation that is created due to a viewBox does not affect the x, y, width and height attributes (or in the case of the 'marker' element, the markerWidth and markerHeight attributes) on the element with the viewBox attribute. Thus, in the example above which shows an 'svg' element which has attributes width, height and viewBox, the width and height attributes represent values in the coordinate system that exists before the viewBox transformation is applied. On the other hand, like the transform attribute, it does establish a new coordinate system for all other attributes and for descendant elements. In some cases, typically when using the viewBox attribute, it is desirable that the graphics stretch to fit non-uniformly to take up the entire viewport. In other cases, it is desirable that uniform scaling be used for the purposes of preserving the aspect ratio of the graphics. Attribute preserveAspectRatio="<align> [<meetOrSlice>]", which is available for all elements that establish a new viewport (see elements that establish viewports), plus the 'image', 'marker', 'pattern' and 'view' elements, indicates whether or not to force uniform scaling. For elements that establish a new viewport (see elements that establish viewports), plus the 'marker', 'pattern' and 'view' elements, preserveAspectRatio only applies when a value has been provided for viewBox on the same element. For these elements, if attribute viewBox is not provided, then preserveAspectRatio is ignored. For 'image' elements, preserveAspectRatio indicates how referenced images should be fitted with respect to the reference rectangle and whether the aspect ratio of the referenced image should be preserved with respect to the current user coordinate system. none - Do not force uniform scaling. Scale the graphic content of the given element non-uniformly if necessary such that the element's bounding box exactly matches the viewport rectangle. Example PreserveAspectRatio illustrates the various options on preserveAspectRatio. To save space, XML entities have been defined for the three repeated graphic objects, the rectangle with the smile inside and the outlines of the two rectangles which have the same dimensions as the target viewports. The example creates several new viewports by including 'svg' sub-elements embedded inside the outermost 'svg' element (see Establishing a new viewport). <rect x="1" y="1" width="448" height="298"
<svg preserveAspectRatio="xMinYMin meet" viewBox="0 0 30 40"
<svg preserveAspectRatio="xMidYMid meet" viewBox="0 0 30 40"
<svg preserveAspectRatio="xMaxYMax meet" viewBox="0 0 30 40"
<svg preserveAspectRatio="xMinYMin slice" viewBox="0 0 30 40"
<svg preserveAspectRatio="xMidYMid slice" viewBox="0 0 30 40"
<svg preserveAspectRatio="xMaxYMax slice" viewBox="0 0 30 40"
The bounds of the new viewport are defined by the x, y, width and height attributes on the element establishing the new viewport, such as an 'svg' element. Both the new viewport coordinate system and the new user coordinate system have their origins at (x, y), where x and y represent the value of the corresponding attributes on the element establishing the viewport. The orientation of the new viewport coordinate system and the new user coordinate system correspond to the orientation of the current user coordinate system for the element establishing the viewport. A single unit in the new viewport coordinate system and the new user coordinate system are the same size as a single unit in the current user coordinate system for the element establishing the viewport. For an extensive example of creating new viewports, see Example PreserveAspectRatio. A 'symbol' element define new viewports whenever they are instanced by a 'use' element. An 'image' element that references an SVG file will result in the establishment of a temporary new viewport since the referenced resource by definition will have an 'svg' element. A 'foreignObject' element creates a new viewport for rendering the content that is within the element. Whether a new viewport also establishes a new additional clipping path is determined by the value of the 'overflow' property on the element that establishes the new viewport. If a clipping path is created to correspond to the new viewport, the clipping path's geometry is determined by the value of the 'clip' property. Also, see Clip to viewport vs. clip to viewBox. All coordinates and lengths in SVG can be specified with or without a unit identifier. As in CSS, the em and ex unit identifiers are relative to the current font's font-size and x-height, respectively. One px unit is defined to be equal to one user unit. Thus, a length of "5px" is the same as a length of "5". Note that at initialization, a user unit in the the initial coordinate system is equivalenced to the parent environment's notion of a px unit. Thus, in the the initial coordinate system, because the user coordinate system aligns exactly with the parent's coordinate system, and because often the parent's coordinate system aligns with the device pixel grid, "5px" might actually map to 5 devices pixels. However, if there are any coordinate system transformation due to the use of transform or viewBox attributes, because "5px" maps to 5 user units and because the coordinate system transformations have resulted in a revised user coordinate system, "5px" likely will not map to 5 device pixels. As a result, in most circumstances, "px" units will not map to the device pixel grid. Note that use of px units or any other absolute unit identifiers can cause inconsistent visual results on different viewing environments since the size of "1px" may map to a different number of user units on different systems; thus, absolute units identifiers are only recommended for the width and the height on outermost 'svg' elements and situations where the content contains no transformations and it is desirable to specify values relative to the device pixel grid or to a particular real world unit size. For any x-coordinate value or width value expressed as a percentage of the viewport, the value to use is the specified percentage of the actual-width in user units for the nearest containing viewport, where actual-width is the width dimension of the viewport element within the user coordinate system for the viewport element. For any y-coordinate value or height value expressed as a percentage of the viewport, the value to use is the specified percentage of the actual-height in user units for the nearest containing viewport, where actual-height is the height dimension of the viewport element within the user coordinate system for the viewport element. For any other length value expressed as a percentage of the viewport, the percentage is calculated as the specified percentage of sqrt((actual-width)**2 + (actual-height)**2))/sqrt(2). 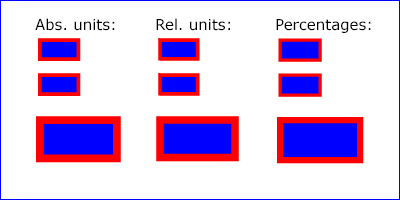 Example Units below illustrates some of the processing rules for different types of units. 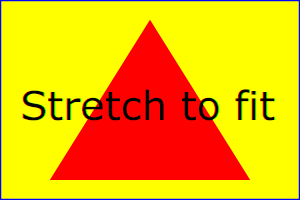 <svg width="400px" height="200px" viewBox="0 0 4000 2000"
<rect x="5" y="5" width="3990" height="1990"
The three rectangles on the left demonstrate the use of one of the absolute unit identifiers, the "in" unit (inch). The reference image above was generated on a 96dpi system (i.e., 1 inch = 96 pixels). Therefore, the topmost rectangle, which is specified in inches, is exactly the same size as the middle rectangle, which is specified in user units such that there are 96 user units for each corresponding inch in the topmost rectangle. (Note: on systems with different screen resolutions, the top and middle rectangles will likely be rendered at different sizes.) The bottom rectangle of the group illustrates what happens when values specified in inches are scaled. The three rectangles in the middle demonstrate the use of one of the relative unit identifiers, the "em" unit. Because the 'font-size' property has been set to 150 on the outermost 'g' element, each "em" unit is equal to 150 user units. The topmost rectangle, which is specified in "em" units, is exactly the same size as the middle rectangle, which is specified in user units such that there are 150 user units for each corresponding "em" unit in the topmost rectangle. The bottom rectangle of the group illustrates what happens when values specified in "em" units are scaled. The three rectangles on the right demonstrate the use of percentages. Note that the width and height of the viewport in the user coordinate system for the viewport element (in this case, the outermost 'svg' element) are 4000 and 2000, respectively, because processing the viewBox attribute results in a transformed user coordinate system. The topmost rectangle, which is specified in percentage units, is exactly the same size as the middle rectangle, which is specified in equivalent user units. In particular, note that the 'stroke-width' property in the middle rectangle is set to 1% of the sqrt((actual-width)**2 + (actual-height)**2)) / sqrt(2), which in this case is .01*sqrt(4000*4000+2000*2000)/sqrt(2), or 31.62. The bottom rectangle of the group illustrates what happens when values specified in percentage units are scaled. 'linearGradient' gradientUnits="objectBoundingBox" Indicates that the attributes which specify the gradient vector (x1, y1, x2, y2) represent fractions or percentages of the bounding box of the element to which the gradient is applied. 'radialGradient' gradientUnits="objectBoundingBox" Indicates that the attributes which specify the center (cx, cy), the radius (r) and focus (fx, fy) represent fractions or percentages of the bounding box of the element to which the gradient is applied. 'pattern' patternUnits="objectBoundingBox" Indicates that the attributes which define how to tile the pattern (x, y, width, height) are established using the bounding box of the element to which the pattern is applied. 'pattern' patternContentUnits="objectBoundingBox" Indicates that the user coordinate system for the contents of the pattern is established using the bounding box of the element to which the pattern is applied. 'clipPath' clipPathUnits="objectBoundingBox" Indicates that the user coordinate system for the contents of the 'clipPath' element is established using the bounding box of the element to which the clipping path is applied. 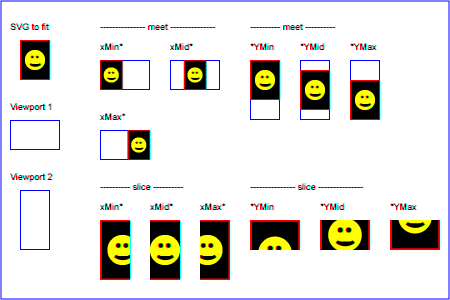 'mask' maskUnits="objectBoundingBox" Indicates that the attributes which define the masking region (x, y, width, height) is established using the bounding box of the element to which the mask is applied. 'mask' maskContentUnits="objectBoundingBox" Indicates that the user coordinate system for the contents of the 'mask' element are established using the bounding box of the element to which the mask is applied. 'filter' filterUnits="objectBoundingBox" Indicates that the attributes which define the filter effects region (x, y, width, height) represent fractions or percentages of the bounding box of the element to which the filter is applied. 'filter' primitiveUnits="objectBoundingBox" Indicates that the various length values within the filter primitives represent fractions or percentages of the bounding box of the element to which the filter is applied. In the discussion that follows, the term applicable element is the element to which the given effect applies. For gradients and patterns, the applicable element is the graphics element which has its 'fill' or 'stroke' property referencing the given gradient or pattern. (See Inheritance of Painting Properties. For special rules concerning text elements, see the discussion of object bounding box units and text elements.) For clipping paths, masks and filters, the applicable element can be either a container element or a graphics element. When keyword objectBoundingBox is used, then the effect is as if a supplemental transformation matrix were inserted into the list of nested transformation matrices to create a new user coordinate system. First, the (minx,miny) and (maxx,maxy) coordinates are determined for the applicable element and all of its descendants. The values minx, miny, maxx and maxy are determined by computing the maximum extent of the shape of the element in X and Y with respect to the user coordinate system for the applicable element. The bounding box is the tightest fitting rectangle aligned with the axes of the applicable element's user coordinate system that entirely encloses the applicable element and its descendants. The bounding box is computed exclusive of any values for clipping, masking, filter effects, opacity and stroke-width. For curved shapes, the bounding box encloses all portions of the shape, not just end points. For 'text' elements, for the purposes of the bounding box calculation, each glyph is treated as a separate graphics element. The calculations assume that all glyphs occupy the full glyph cell. For example, for horizontal text, the calculations assume that each glyph extends vertically to the full ascent and descent values for the font. When percentages are used with attributes that define the gradient vector, the pattern tile, the filter region or the masking region, a percentage represents the same value as the corresponding decimal value (e.g., 50% means the same as 0.5). If percentages are used within the content of a 'pattern', 'clipPath', 'mask' or 'filter' element, these values are treated according to the processing rules for percentages as defined in Units. Any numeric value can be specified for values expressed as a fraction or percentage of object bounding box units. In particular, fractions less are zero or greater than one and percentages less than 0% or greater than 100% can be specified. Keyword objectBoundingBox should not be used when the geometry of the applicable element has no width or no height, such as the case of a horizontal or vertical line, even when the line has actual thickness when viewed due to having a non-zero stroke width since stroke width is ignored for bounding box calculations. When the geometry of the applicable element has no width or height and objectBoundingBox is specified, then the given effect (e.g., a gradient or a filter) will be ignored. The following interfaces are defined below: SVGPoint, SVGPointList, SVGMatrix, SVGTransform, SVGTransformList, SVGAnimatedTransformList, SVGPreserveAspectRatio, SVGAnimatedPreserveAspectRatio. in SVGMatrix matrix The matrix which is to be applied to this SVGPoint object. SVGPoint A new SVGPoint object. This interface defines a list of SVGPoint objects. SVGPointList has the same attributes and methods as other SVGxxxList interfaces. Implementers may consider using a single base class to implement the various SVGxxxList interfaces. in SVGPoint newItem The item which should become the only member of the list. SVGPoint The item being inserted into the list. in SVGPoint newItem The item which is to be inserted into the list. If the index is equal to 0, then the new item is inserted at the front of the list. If the index is greater than or equal to numberOfItems, then the new item is appended to the end of the list. in SVGPoint newItem The item which is to be inserted into the list. The first item is number 0. The a component of the matrix. The b component of the matrix. The c component of the matrix. The d component of the matrix. The e component of the matrix. The f component of the matrix. Performs matrix multiplication. This matrix is post-multiplied by another matrix, returning the resulting new matrix. in SVGMatrix secondMatrix The matrix which is post-multiplied to this matrix. SVG_MATRIX_NOT_INVERTABLE: Raised if this matrix is not invertable. Post-multiplies a translation transformation on the current matrix and returns the resulting matrix. in float x The distance to translate along the x-axis. in float y The distance to translate along the y-axis. Post-multiplies a uniform scale transformation on the current matrix and returns the resulting matrix. in float scaleFactor Scale factor in both X and Y.
Post-multiplies a non-uniform scale transformation on the current matrix and returns the resulting matrix. in float scaleFactorX Scale factor in X.
in float scaleFactorY Scale factor in Y.
Post-multiplies a rotation transformation on the current matrix and returns the resulting matrix. in float angle Rotation angle. Post-multiplies a rotation transformation on the current matrix and returns the resulting matrix. The rotation angle is determined by taking (+/-) atan(y/x). The direction of the vector (x,y) determines whether the positive or negative angle value is used. in float x The X coordinate of the vector (x,y). Must not be zero. in float y The Y coordinate of the vector (x,y). Must not be zero. SVG_INVALID_VALUE_ERR: Raised if one of the parameters has an invalid value. Post-multiplies the transformation [-1 0 0 1 0 0] and returns the resulting matrix. Post-multiplies the transformation [1 0 0 -1 0 0] and returns the resulting matrix. Post-multiplies a skewX transformation on the current matrix and returns the resulting matrix. in float angle Skew angle. Post-multiplies a skewY transformation on the current matrix and returns the resulting matrix. SVGTransform is the interface for one of the component transformations within a SVGTransformList; thus, a SVGTransform object corresponds to a single component (e.g., "scale(..)" or "matrix(...)") within a transform attribute specification. SVG_TRANSFORM_UNKNOWN The unit type is not one of predefined types. It is invalid to attempt to define a new value of this type or to attempt to switch an existing value to this type. The type of the value as specified by one of the constants specified above. The matrix that represents this transformation. For SVG_TRANSFORM_MATRIX, the matrix contains the a, b, c, d, e, f values supplied by the user. For SVG_TRANSFORM_TRANSLATE, e and f represent the translation amounts (a=1,b=0,c=0,d=1). For SVG_TRANSFORM_SCALE, a and d represent the scale amounts (b=0,c=0,e=0,f=0). For SVG_TRANSFORM_ROTATE, SVG_TRANSFORM_SKEWX and SVG_TRANSFORM_SKEWY, a, b, c and d represent the matrix which will result in the given transformation (e=0,f=0). A convenience attribute for SVG_TRANSFORM_ROTATE, SVG_TRANSFORM_SKEWX and SVG_TRANSFORM_SKEWY. It holds the angle that was specified. For SVG_TRANSFORM_MATRIX, SVG_TRANSFORM_TRANSLATE and SVG_TRANSFORM_SCALE, angle will be zero. Sets the transform type to SVG_TRANSFORM_MATRIX, with parameter matrix defining the new transformation. in SVGMatrix matrix The new matrix for the transformation. Sets the transform type to SVG_TRANSFORM_TRANSLATE, with parameters tx and ty defining the translation amounts. in float tx The translation amount in X.
in float ty The translation amount in Y. Sets the transform type to SVG_TRANSFORM_SCALE, with parameters sx and sy defining the scale amounts. in float sx The scale factor in X.
in float sy The scale factor in Y. Sets the transform type to SVG_TRANSFORM_ROTATE, with parameter angle defining the rotation angle and parameters cx and cy defining the optional centre of rotation. in float angle The rotation angle. in float cx The x coordinate of centre of rotation. in float cy The y coordinate of centre of rotation. Sets the transform type to SVG_TRANSFORM_SKEWX, with parameter angle defining the amount of skew. in float angle The skew angle. Sets the transform type to SVG_TRANSFORM_SKEWY, with parameter angle defining the amount of skew. This interface defines a list of SVGTransform objects. The SVGTransformList and SVGTransform interfaces correspond to the various attributes which specify a set of transformations, such as the transform attribute which is available for many of SVG's elements. SVGTransformList has the same attributes and methods as other SVGxxxList interfaces. Implementers may consider using a single base class to implement the various SVGxxxList interfaces. in SVGTransform newItem The item which should become the only member of the list. SVGTransform The item being inserted into the list. in SVGTransform newItem The item which is to be inserted into the list. in SVGTransform newItem The item which is to be inserted into the list. The first item is number 0. Creates an SVGTransform object which is initialized to transform of type SVG_TRANSFORM_MATRIX and whose values are the given matrix. in SVGMatrix matrix The matrix which defines the transformation. SVGTransform The returned SVGTransform object. Consolidates the list of separate SVGTransform objects by multiplying the equivalent transformation matrices together to result in a list consisting of a single SVGTransform object of type SVG_TRANSFORM_MATRIX. SVGTransform The resulting SVGTransform object which becomes single item in the list. If the list was empty, then a value of null is returned. Used for the various attributes which specify a set of transformations, such as the transform attribute which is available for many of SVG's elements, and which can be animated. If the given attribute or property is being animated, contains the current animated value of the attribute or property, and both the object itself and its contents are readonly. If the given attribute or property is not currently being animated, contains the same value as 'baseVal'. SVG_PRESERVEASPECTRATIO_UNKNOWN The enumeration was set to a value that is not one of predefined types. It is invalid to attempt to define a new value of this type or to attempt to switch an existing value to this type. SVG_PRESERVEASPECTRATIO_NONE Corresponds to value 'none' for attribute preserveAspectRatio. SVG_PRESERVEASPECTRATIO_XMINYMIN Corresponds to value 'xMinYMin' for attribute preserveAspectRatio. SVG_PRESERVEASPECTRATIO_XMIDYMIN Corresponds to value 'xMidYMin' for attribute preserveAspectRatio. SVG_PRESERVEASPECTRATIO_XMAXYMIN Corresponds to value 'xMaxYMin' for attribute preserveAspectRatio. SVG_PRESERVEASPECTRATIO_XMINYMID Corresponds to value 'xMinYMid' for attribute preserveAspectRatio. SVG_PRESERVEASPECTRATIO_XMIDYMID Corresponds to value 'xMidYMid' for attribute preserveAspectRatio. SVG_PRESERVEASPECTRATIO_XMAXYMID Corresponds to value 'xMaxYMid' for attribute preserveAspectRatio. SVG_PRESERVEASPECTRATIO_XMINYMAX Corresponds to value 'xMinYMax' for attribute preserveAspectRatio. SVG_PRESERVEASPECTRATIO_XMIDYMAX Corresponds to value 'xMidYMax' for attribute preserveAspectRatio. SVG_PRESERVEASPECTRATIO_XMAXYMAX Corresponds to value 'xMaxYMax' for attribute preserveAspectRatio. SVG_MEETORSLICE_UNKNOWN The enumeration was set to a value that is not one of predefined types. It is invalid to attempt to define a new value of this type or to attempt to switch an existing value to this type. SVG_MEETORSLICE_MEET Corresponds to value 'meet' for attribute preserveAspectRatio. SVG_MEETORSLICE_SLICE Corresponds to value 'slice' for attribute preserveAspectRatio. The type of the alignment value as specified by one of the constants specified above. The type of the meet-or-slice value as specified by one of the constants specified above. Used for attributes of type SVGPreserveAspectRatio which can be animated.